We’ve all heard about the escalating “Student Debt Crisis” – that student loans are the only kind of consumer loan that didn’t contract during the Great Recession. Consumers took out less credit card debt, auto loans, home equity loans and mortgage debt across the board, but student loans have grown to nearly $1 trillion as of June 2013. At NerdWallet, we were interested in studying the impact these loans might have on other areas of people’s lives. Specifically, how do student loans impact home ownership later in life? 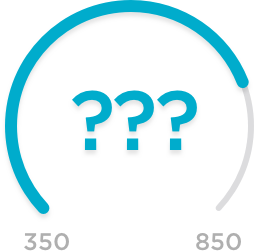 Together with SmarterBucks and Student Loan Hero, we surveyed 2,616 student loan holders, to understand how exactly student debt impacts home buying. We call this impact of student debt on later mortgage borrowing decisions “debt-consciousness”. 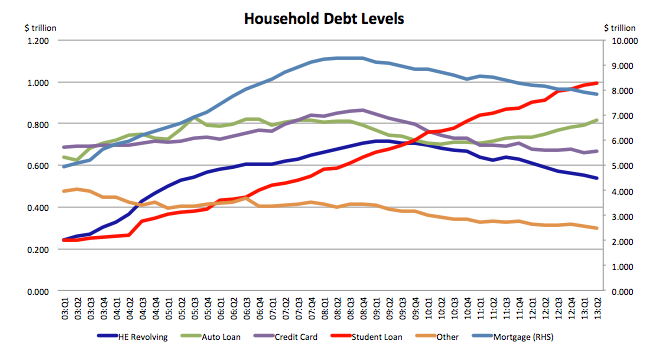 1) Debt-consciousness is a function of financial literacy, not total debt burden. Greater financial literacy causes women to be more cautious in home buying, yet the more financially literate men in our sample were largely unresponsive to student debt-consciousness. 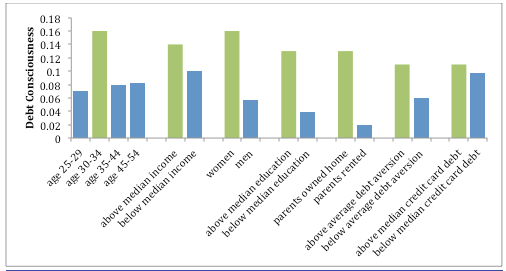 This result held true when controlled for for income and education levels across the male and female respondents. These differences are consistent with recent work by Muriel Niederle at Stanford that finds men and women respond and plan for risk differently. These findings suggest that as student debt levels continue to rise, we will see a follow-on impact in the housing markets that won’t be affected by traditional policy levers like interest rate policy and credit underwriting standards. On a brighter note, our results suggest that increasing financial literacy might have a real impact on making homebuyers with student loans more cautious. In the wake of the housing and sub-prime mortgage collapse, this may be a welcome change. NerdWallet conducted this study with the assistance of Professor Benjamin Ho of Vassar College, as well as the folks at Student Loan Hero and SmarterBucks. We surveyed 2,616 student loan holders, using a number of economic, psychometric and demographic measures to ascertain the behavioral channels through which student loan debt affects their home buying decisions. The primary variable of interest was the relationship between the respondent’s monthly debt payments and how he or she responded to our query about how whether debt has caused the respondent to delay buying a home. We call this variable debt-consciousness. Our debt-consciousness metric was the coefficient of an ordinary least squares regression of a 7 point Likert measure of respondent’s self-reported delay of buying a home regressed on their monthly student loan debt level.